Animal organs. Integument. Thick skin Atlas of plant and animal histology. This image of thick skin is from the palm of a rat hand. The epidermis is keratinized stratified squamous epithelium with a very thick layer of keratin constituting the corneum stratum. 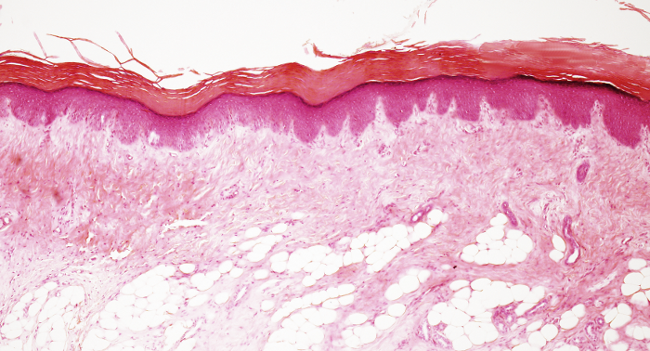 The different layers of the epidermis are clearly visible (see this image to learn the layers of epidermis). The thickness is caused by mechanical stress, like stretching and pressure, so that if these inputs stop the epidermis becomes thinner again. The epidermal ridges and dermal papilllae form the border between epidermis and dermis. Both are more developed than in the thin skin. Thick skin lacks hair follicles and sebaceous glands. However, sweat glands are present in the thick skin (no visible in this picture). Papillar and reticular dermis can be distinguished by the intensity of eosin staining, being papillar dermis more clear than reticular dermis. Reticular dermis contains abundant and dense collagen fibers in the extracellular matrix. The hypodermis can be distinguished by the large amount of adipocytes.